Have you ever woken up to a sore jaw or to someone complaining about the gnashing sound your teeth make while you were asleep? You could be suffering from bruxism, one of the most common sleep disorders. Before we delve further into bruxism, let us talk about occlusion. Occlusion applies to any contact between the lower and upper teeth in any position of the lower jaw. Contact is made between upper and lower teeth as in clenching, grinding and sometimes with soft tissue or foreign material. Do you know that the total duration of tooth contact in a 24-hour period is 17.5 minutes with 9 minutes chewing contact and 8.5 minutes of swallowing contact? Excessive occlusal stresses can occur where stress exceed tissue adaptation in the mouth and therefore cause occlusal trauma. Occlusal trauma is the damage to the supporting tissues when subjected to excessive occlusal trauma. What causes excessive occlusal stresses? Parafunction means outside the range of functional activity. It is can be habitual in which the person is usually unaware or it may be associated with psychological factors, for example anger, anxiety or frustration. Oral parafunctional habits may include bruxism, mouth breathing and any other habitual use of the mouth unrelated to eating, drinking, or speaking. Bruxism is a clenching or grinding habit when the individual is not chewing or swallowing. Teeth grinding is usually seen at night and it is caused by nervous tension or interferences in normal biting that leads to excessive loads on the tooth. Sleep bruxism usually go unnoticed by individuals. Only a small number develop symptoms that include jaw pain and headache. The first person to notice this clenching teeth habit would usually be your parent or sleeping partner, though that would be times where you will awake with bruxism pain. 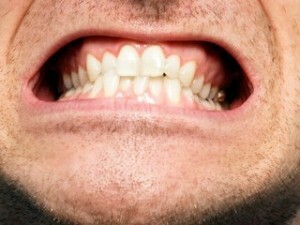 Advanced attrition (tooth wear) – shiny wear facets that could only be produced in extreme positions of jaw movements. Tooth sensitivity due to the abnormal tooth wear that abrades the hard enamel layer away, exposing the soft dentine layer below. Tooth decay or fracture may follow. Occlusal trauma leading to increased tooth mobility that does not proportionate to the degree of gum inflammation or amount of gum recession. Tenderness and fatigue of jaw muscles usually those involves in chewing due to excessive jaw movements. Temporomandibular joint (TMJ) dysfunction – clicking of jaw joint heard or dull pain felt usually on one side. Damage to the teeth and its supporting tissue (periodontal ligament and bone). Affects the proprioceptive (the ability to sense the position and location and orientation and movement of the body and its parts) nerve endings and impairs protective reflexes. The most reliable diagnostic technique is measuring EMG (electromyography) that picks up electrical signals from masseter and temporalis (the chewing muscles). Tooth wear alone would not be able to confirm the diagnosis for that are many causes for tooth wear. A regular visit to the dentist could allow symptoms such as jaw muscle tenderness and tooth wear to be detected and subsequent treatment to be commenced. Reassurance by your doctor or dentist. If detected early on, eliminating the cause(s) of bruxism may cure the disorder, though habit modification may be required if the disorder has turned habitual. Occlusal adjustment – Selective grinding of tooth surface to reduce disharmony between tooth contacts. 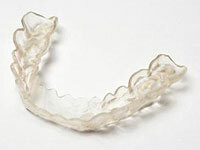 Occlusal splints or mouth guards – vulcanite or plastic splint to cover some or all the upper and lower teeth surfaces in order to reduce tooth wear and muscle strain. Psychotherapy – counseling for tension relief and habit awareness to increase voluntary control. Relaxation training, for example hypnosis and behavior conditioning. Dental restoration – Root canal therapy may be required for those with severe tooth wear and sensitivity. Damaged teeth can be replaced with dental crowns.